In 2014, investors showed they were not as patient with conglomerates as some business models often require. Here's how to think about 2015. NEW YORK (TheStreet) -- Industrial conglomerates -- corporations made up of various seemingly unrelated businesses -- can be tough to understand. These companies draw revenue from multiple sectors and industries, but they can also be exposed to more risk than companies that focus on just one market. With 2014 aggregate gains of just 2.62%, according to Fidelity, conglomerates grossly underperformed the 8.34% gain for the Dow Jones Industrial Average (DJI and the 12.45% gain for the S&P 500 (SPY - Get Report) . Investors showed they were not as patient with conglomerates as some business models often require. It's true a well-diversified operation like 3M (MMM - Get Report) (up 19.27%) can bring an element of safety. But when some businesses get large and difficult to manage efficiently, investors panic. In 2014, that's what hurt Swiss automation and power equipment company ABB (ABB - Get Report) , whose shares are down 19.31%. This is despite increasing demand for reliable electricity and automation solutions to help customers improve energy efficiency and lower environmental impact. Despite ABB's positive long-term outlook about its ability to grow cash, reduce costs and stabilize its businesses in the quarters ahead, shares have been punished. Short-term uncertainties about macroeconomic volatility and geopolitical issues are important factors, since ABB has heavy emerging market exposure. Perhaps the biggest conglomerate making headlines in 2014 was General Electric (GE - Get Report) , which began the year promising to get back to its industrial roots. Despite its shares being down 8.28% on the year, GE lived up to that promise. In June, GE closed its $17 billion deal for struggling French company Alstom (ALSMY and its various assets, including Alstom’s global gas and steam turbine equipment and services business. These businesses, which have a large customer base in Europe, generated more than $10 billion in annual revenue combined. Securing Alstom wasn't easy, however. German conglomerate Siemens (SIEGY , whose shares are down 17.16%, partnered with Japanese conglomerate Mitsubishi Heavy Industries (MHVYF to make a counter offer for Alstom. GE response with a sweetened offer, taking a 50% stake in Alstom's renewable energy business. For Alstom, this was too good to pass up. GE now has a strong complement to its global position in the onshore wind industry. Alstom's renewable energy business has a solid offshore wind technology, ranking it No. 1 in the world in hydroelectric turbines and generators. That business generates $2 billion in annual revenue. All told, by spending $17 billion, GE acquired at least $12 billion worth of annual revenue. That's assuming these other assets don't generate anything, which is unlikely. GE has secured enough growth for the next 10 years. 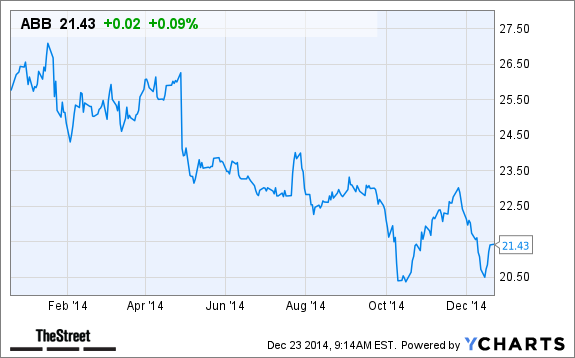 GE shares should rebound in 2015. If GE can grow its revenue at a long-term rate of 4% to 5%, these shares should reach $30 to $32 in the next 12 to 18 months, from around $25 now. While GE bought more assets to get bigger, other conglomerates looked for ways to get smaller and more profitable. Procter & Gamble (PG - Get Report) , maker of consumer products like Tide detergent and Pampers diapers, made that move. With shares up 13.75% in 2014, P&G investors showed their support for the company's divestment plans. In October P&G split off its Duracell battery line and aimed at focusing on higher-margin businesses. Duracell wasn't on the market for long. Rival conglomerate Berkshire Hathaway (BRK.A - Get Report) bought the battery line for $4.7 billion. As with GE, Procter & Gamble is a stock to watch in 2015. Shedding off its low-margin businesses will make the new Procter & Gamble leaner and far simpler to manage, and more profitable. The company has already sold off 25 brands, including seven from its pet care segment, generating more than $2.9 billion in cash. 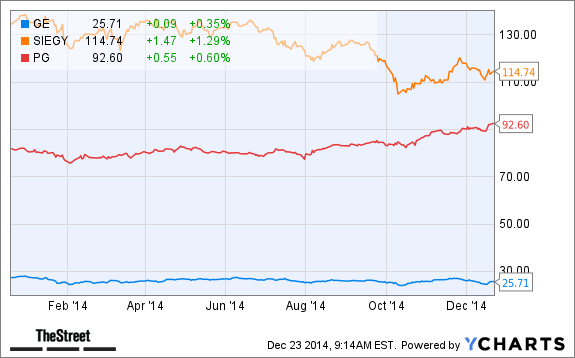 Others conglomerates to consider in 2015 include Honeywell (HON - Get Report) (up 10.77% this year) and Danaher (DHR - Get Report) (up 12.64%) -- two of the top outperformers in 2014. While both are trading at near 52-week highs, both have high analyst 12-month price targets that suggest possible gains of 20% or more. Investors should also keep an eye on 3M. In August the company announced that its subsidiary, 3M New Ventures, has taken an equity stake in Smart Energy Instruments, a Canadian company that develops electronic chipsets for smart grids. This is an industry that is projected to grow $50 billion by 2023. To the extent that 3M can leverage Smart Energy's expertise, 3M -- like General Electric -- can secure its next leg of growth for the next decade. With shares trading at around $165, investors buying at this level can look for a price of $190 to $200 in the next 12 to 18 months, generating gains of 15% to 20%.